The Smithsonian in Washington, D.C. is the largest and one of the finest museum complexes in the world. It has 18 major museums, a national zoo, and a number of research centers. Collectively they annually attract over 20 million visitors. These two venues (and those on the next page) are the Smithsonian destinations that have proven to be of most interest to travelers. All are located in Washington, D.C. except for the Cooper-Hewitt in New York City. This is the world's most popular museum, with 9 million visitors per year. 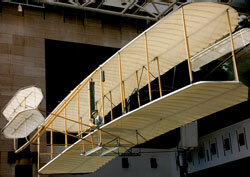 The many must-see objects include the Wright Brothers' plane (see photo) that made the first manned-flight in 1903, Lindbergh's Spirit of St. Louis plane that made the first solo trans-Atlantic journey in 1927, and the Apollo 11 command module that transported Neil Armstrong from earth to the moon in 1969. There is even a lunar rock you can touch. It is the Smithsonian's second most popular museum and ranks among the world's finest natural history museums. Don't miss exhibitions include the Dinosaur Hall, Mammal Hall, Insect Zoo, African Voices, and Hall of Geology. The last displays the celebrated "cursed" Hope Diamond.